Devin Aikin (right) with the British Columbia School for the Deaf basketball team – the Grizzlies. Devin Aikin is passionate about basketball since he was 10 years old, and today he shares his passion with the Grizzlies (boys and girls) of the British Columbia School for the Deaf (BCSD). Aikin has been coaching the Grizzlies since the last four years, and recently the British Columbia team that will participate at the Canada Deaf Games from Feb. 21 to 24 in Winnipeg. 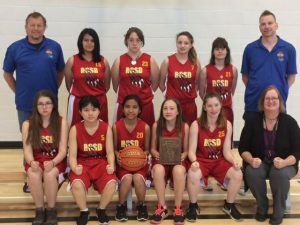 The BC team is formed of youth and adults aged between 16 and 20 years old, including two players from the Grizzlies and three former players, who graduated from the BCSD. The team will take part in the very first 3 vs. 3 tournament as well as an exhibition game against Team East. Players from BC, Alberta and Manitoba will represent Western Canada for this exhibition game. “I’m very honoured to have been asked to coach Team West, because it is a golden opportunity to see players from across Canada play together. It will be like sitting in the front rows at a NBA game! I support both teams, because these players will represent Canada someday,” said Aikin. Aikin is not stranger to competition as he played for the Burnaby South Rebels in high school. He was the only Deaf player on the team. He admits that he faced communication barriers, but it all changed when he began coaching the Grizzlies. “There are no communication barriers when I work with the Grizzlies. Everyone can play and learn together. It is a beauty of a thing to coach Deaf teams,” said proudly Aikin. Akin and the Grizzlies participated at several competitions, including the Western States Basketball Classic in the United States in the last three years. Aikin was also assistant coach for Team Canada at the 2016 Pan American Deaf Basketball Regional Qualification in Maryland, USA. On top of his coaching duties at the BCSD Aikin also organizes a basketball camp each summer for Deaf and hard of hearing aged 7 to 18 years old. Aikin is very excited to attend the Canada Deaf Games as he believes it is a great opportunity for athletes, coaches and Provincial Deaf Sports Associations. “I look forward to see all athletes at the Games, especially young prospects. It will be a rich experience for everyone. It is a growing process for many athletes to start their athletic career at the Games and it is an excellent opportunity for them to offer their best performances and shine,” said Aikin. The basketball games will be on Feb. 23 and 24. Consult the Games schedule.